Andrzej Wajda. Official Website of Polish movie director - Films - "A Chronicle of Amorous Incidents"
In the end, I too felt beset by the infinite boredom of martial law, so I urgently began to look for some kind of refuge, where I could rediscover myself. So I turned to a story by Tadeusz Konwicki which I had read years earlier, and began working on A Chronicle of Amorous Incidents. To depict the land of childhood on the screen is no easy task. Either it is closed to others behind the door of our own memory, or it is boring, because it is too reminiscent of the childhood of others. This was not the only trouble; finding a pair of young leads proved to be even more difficult. My absence from the country (Danton), several months long, had stopped me watching what was happening on Polish stage and screen, especially in the drama schools. I recommenced endless screen tests, and for a long time could not decide who in the end would play Witek and Alina. The story takes place in Vilnius. Unfortunately, the cinematography authorities, probably out of spite, refused me permission to film on location in Lithuania, although other Polish films at the time had been allowed to do so. As a result, I was reduced to painstaking re-construction of the land of childhood in several far-flung places, starting with Warsaw, Przemysl and Kazimierz on the Vistula, and as far as Drohiczyn. Writing the script was not easy either. Konwicki, though himself a film director, does not write with film in mind. Words are his element, and he wields them like a master, leaving the problem of adaptation to the filmmakers. This was difficult, and today I think that I did not entirely manage to cope with the job. The army also refused to cooperate, for the usual reasons. This was especially bothersome since we were to film the preparations for the War of 1939. 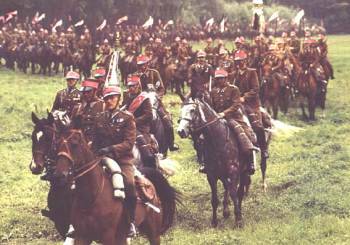 However, on learning that I wanted to show the famous pink 13th Regiment of Vilnius Uhlans, horsemen arrived from all over Poland, and three hundred people appeared on horseback in Boguslawice in full ceremonial dress. It seems that in this work one artist, Wajda, placed his technical skills at the disposal of another artist, Konwicki, who is the real "author" and "owner" of the enchanted world on the screen. Such humility as Wajda's, who is a distinguished and unique artist, is a rare event in the creative arts. It is unusual for somebody to hide in the shadows, to indicate so clearly - through the narrative form and in the type of heroes - that the world on the screen is not of making, that it reflects neither his own childhood nor his memories, that the beauty shown was not seen through his own eyes, but that he is depicting the world, memories, and experiences of another - Tadeusz Konwicki. It is true that the background story, the short volume of memoirs by Konwicki, was ready narrative material. It is therefore not surprising, that Wajda has entrusted the part called The Stranger to Konwicki himself; he is that contemprary looking, unmade-up person in modern dress, who not only guides us around his past, but also participates in the action, meets and talks with the very young actor playing his old self, in other words, plays the peculiar part of his own "ghost", haunting, as we hear from the screen, only himself, and unable to frighten anyone else? Despite superficial similarities, A Chronicle of Amorous Incidents is quite removed from those Wajda's works which were based on the prose of Jaroslaw Iwaszkiewicz. Unlike The Birch Wood this film is not about death, raising questions about the sense of human existence. Nor is it - as in The Maids from Wilko - about the way time destroys emotion and human dreams. The really elemental thing in the existence of the heroes of A Chronicle, the thing absolutely crucial to their destiny, is History with a capital H. Except that here it is viewed from a singular perspective. If childhood - which I doubt very much - is indeed the land of happiness, then we should keep in mind that our era, for us so full of bitterness, will one day be recalled with nostalgia by our children. Because even today - regardless of what is written on the attitudes and habits of youth, there are, like there always were, boys and girls feeling the enchantment of first love. And just like the couple of Konwicki and Wajda, who aren't even aware of the uhlans preparing for their final charge, the young people of today also don't see what is happening around them. And that's all right. That's how it should be.